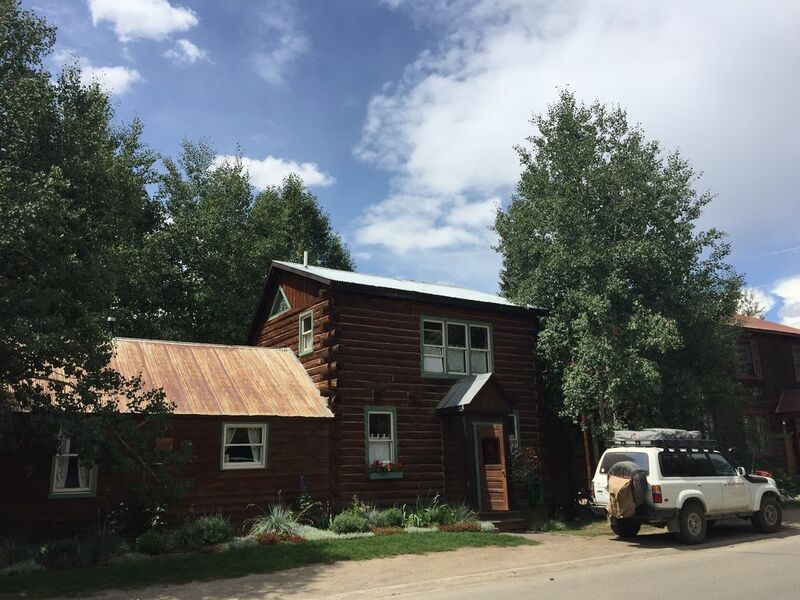 This historic 1800s mining cabin is perfectly situated right in the heart of Crested Butte, just one block from restaurants, shopping and the free shuttle to the ski area. It's a log cabin, with lots of character but is also quite modernized and has good sunlight. Hiking and biking trails are steps away. Our home has three bedrooms, two full baths (one with Jacuzzi tub). This cozy, comfortable home offers the perfect place for friends and family to gather. The sunny kitchen has granite counter-tops, a gas cook-top, microwave, and dishwasher. We like to cook, so you'll find it very well equipped. The kitchen flows into a cozy living room with vaulted ceiling, maple floors, and gas log fireplace. French doors open to a south-facing deck (enlarged and updated in Aug 2017), fenced yard, and a fantastic wildflower gardens... with great town and mountain views. The log addition includes two charming rustic log main floor bedrooms, full bath, and a large mudroom with washer and dryer. Great place for all your skis or bikes. Upstairs is a large master bedroom with vaulted ceiling, queen-size bed, full bath, oak floors, and spectacular views of Mount Crested Butte. The home is furnished with fresh linens and bedding. There are goose down comforters on all the beds. The kitchen is fully-equipped for food preparation and dining. The living area has cable TV/DVD and stereo and broadband Internet access. The small yard is fenced (not high! ), perfect for your canine friends. Everything in town is within easy walking distance. You can park your car because everything including hiking, biking, shopping, Nordic skiing, and the coffee shop are just steps away. 1st and 2nd bedrooms share a bath across the hall. The couch does NOT pull out, so we ask our guests to limit their group to only 6 people for their comfort. We do have a portable crib and stair fences for infants. The large mudroom serves very well in the winter for ski gear, and the washer/dryer is full size. We are American diplomats; we are currently serving America's critical interests in Egypt. We enjoy difficult places because we think it makes a difference. Our son loves America, and having visited 25 different countries and living in 6 countries on three continents, decided to attend the University of Utah. He loves anything outdoors....skiing, climbing, biking. He's dashingly handsome, huh? We have lived and visited all around the world, and decided that Crested Butte would be home: it is absolutely beautiful, and has some of the most interesting, friendly, and least self-possessed people we have ever met. Wild Iris is our home sweet home...until we quit this crazy Foreign Service life we'll share it with you. Come check out Crested butte..you'll love it! Beautiful country...interesting people....friendly people.....town centered home where you can walk everywhere....a town you can still walk in and chat with everyone you see. You can leave your car behind and walk everywhere...now that's freedom, the perfect escape! It's a 5 minute walk to everywhere. We take our son up to the top of the mountains in summer and have a picnic, and then let him mountain bike home....all downhill. The house has lots of mountain character, as do all the people. In winter we strongly recommend that you don't rent a car....you'll never drive it anywhere. What a great life to be car-free. We were so pleased with our stay at this charming, clean, classic mountain home! The location was A++ , we walked to everything and took the bus to ski- was perfect. Home was great for 3 of us and 2 small dogs. Couldn't ask for better! So happy you enjoyed your stay!!! See you again! Perfectly located one block from Elk Street. Tidy little house big enough for a family of four or five. Reasonably priced. Would definitely recommend. Glad you loved Wild Iris and Crested Butte!! Cool little town, huh? :). Try us in summer too...even better! Mountains of snow and right in the middle of town make for a great combination! house was perfect size for our family of five. we had a great time and will look forward to coming back to this house when we stay in town. Great location! Home was great for our needs! Please enquire about any special rates that might be available. Discounts for stays over 7 nights. Also, Spring Break week has higher rates.